When it comes to how Americans view the impact of immigration on U.S. society and life, there’s a big partisan gap – a gap once again reflected in the nation’s politics, particularly in the Republican presidential campaign. Nearly 59 million immigrants have come to the U.S. since Congress passed the nation’s 1965 Immigration and Nationality Act, which reshaped the face of America. Three-quarters of immigrants in this current wave come from Latin America and Asia. Today, there are 45 million immigrants in the U.S. who make up a near-record 14% of the U.S. population, including an estimated 11.3 unauthorized immigrants. Overall, Americans have mixed views about the impact immigrants have had on American society, with 45% saying they are making society better in the long run and 37% saying they are making it worse, according to a Pew Research Center survey conducted in March and April. But the partisan divide on this question is more pronounced. About half of Republicans (53%) say immigrants coming to the U.S. make society worse in the long run, compared with just 24% of Democrats. Crime: Among Republicans, 71% say immigrants in the U.S. are making crime worse, compared with just 34% of Democrats, according to the newly released survey. Meanwhile, Republicans are just half as likely as Democrats (24% vs. 55%) to say immigrants are not having much effect on crime. Becoming part of society: The view that immigrants generally don’t want to assimilate is particularly widespread among Republicans; 81% say immigrants in our country today generally want to hold on to the customs and way of life of their home country, compared with 66% of independents and 55% of Democrats who say the same. Some three-quarters of Republicans (74%) say immigrants do not learn English in a reasonable amount of time, compared with 45% of Democrats. Views of immigrants by region of origin: Americans on both sides of the partisan line have mostly positive or neutral views of Asian and European immigrants. But when it comes to those from Latin America, 58% of Republicans say these immigrants have had a mostly negative impact on society, compared with 23% of Democrats. There is a similar divide on views of Middle Eastern immigrants, with Republicans more than twice as likely as Democrats to view them negatively. Despite these divides, Republicans and Democrats do agree on this point: The U.S. immigration system is broken. 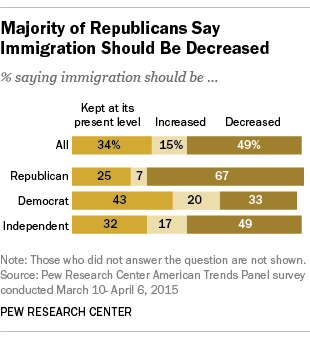 Strong majorities of Republicans (89%) and Democrats (79%) say the immigration system needs major changes or needs to be completely rebuilt. Just 10% of Republicans and 20% of Democrats say the system works well and only needs minor changes.